The air is warm from the heat of the day, and the night sky studded with stars brighter than you ever see in England. The sound of trumpets heralds a procession of men and women dressed in the jeweled silks and velvet of Renaissance Italy. They take their seats on the stand above a length of turf with a barrier running down the middle. The jousting begins with a cry of “Cavalieri, al attacco!” as two horsemen in plumed helmets ride at each other, lances poised in deadly combat. It’s the annual Festival of the Duke at Urbino, in the Marche region of Italy. No matter that Urbino ran out of Dukes several centuries ago. The town enjoys celebrating its history. 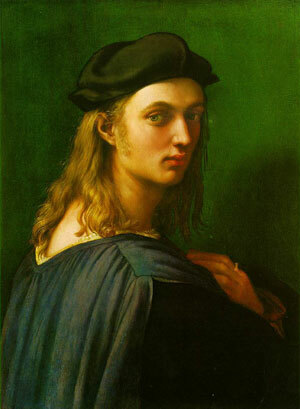 It’s a matter of pride to them that one of the greatest Renaissance artists, Raphael, was born here. In the coming months the National Gallery will celebrate him too as thousands have a chance to peruse his work in a major exhibition, titled Raphael – From Urbino to Rome. The mystique of Raphael permeates Urbino. The self-portrait of the fawn-like boy with long hair is on every postcard stand. His house on a steep street above the Piazza Repubblica became a place of pilgrimage for the Romantic Movement in the 19th century, which built up the legend based on his youth, precocious talent and untimely death. The city itself seems like the stuff of legends. The Marche is, unlike Tuscany and Umbria, relatively untrammeled by tourists and second-home buyers. The area is cut off from the rest of Italy by the Appenines, and is divided into long valleys running down to the Adriatic coast surrounded by steep mountains. Urbino was, until the time of its greatest Duke, Federico, a fortified hill town among others in this region of rival warlords. His architects built its celebrated palace which is a landmark of the region. As you drive up from Pesaro, on the Adriatic coast, the winding road takes you high into the hills until an hour or so later, rounding a bend, you see perched on the rocky hill above, the terracotta walls of Italy’s Renaissance gem. The twin towers of the palace, the dome of the cathedral and church spires against the sky create an unforgettable sight. You can see where Raphael found his early inspiration. I was in Urbino to learn Italian at the University, which runs an annual summer course for foreign students. We stayed in the college buildings on a neighbouring hill, and walked to our classes in the town every day, to toil with aching calf muscles up the steep paved street from the city gates to the main piazza, stopping briefly for a restorative cappuccino before class. On days off, we would take trips to explore the rest of the Marche. We went north to the tiny republic of San Marino – stupendous mountain top site with views over the whole Marche but unlike the rest of the region suffering from tourist overkill. On to San Leo, we travelled roads like a fairground switchback to see the most inaccessible fortress in Italy, perched high on a rock. We headed to Ravenna on the coast to see the exquisite mosaics of the early Byzantine churches. We made several short trips to the coastal resorts of Pesaro (home town of the composer Rossini), Fano and Senigallia, attracted by the beach and the fish restaurants. There was a memorable lunch in Pesaro of grilled calamari and prawns, in a restaurant overlooking sea the colour of lapis lazuri. The son of Giovanni Santi, a talented artist who worked for, among other patrons, the Duke, Raphael took naturally to painting as a child, mixing his paints in his father’s studio. One of his first known paintings, a fresco of the Madonna and Child, is to be found in the room where he was born in 1483. The rolling countryside of the Marche, together with the enlightened attitude of the ducal rulers, who patronized many leading artists of the day and founded the University, nurtured the boy’s imagination and talent. He met artists employed by the Duke, among them Piero della Francesca. He might have stayed in Urbino, but for the death of his mother when he was seven and of his father when he was 11. The young Raphael inherited the house which he shared with his uncle but, with his closest family ties broken, sought a new life. He began his heady rise as the most successful artist of his day at 17, moving first to Perugia, then Florence and Rome. He died aged 37 at the height of his fame. Today, you can visit the house where he first learnt his craft from his father. It’s a town house, typical of a well to do Renaissance craftsman or artist – with its inner courtyard, stone for grinding colours, and spacious studio. Urbino is not the easiest place to reach, which is to its advantage, for it protects the city against an influx of tourists. If you don’t have a car, you have to take a train along the Adriatic coast, alight at Pesaro, (home town of the composer Rossini) and wait for a bus that winds its way through river valleys up into the hills. An hour later, as the bus rounds a bend, you see perched on a rocky hill above, the terracotta walls and towers of Italy’s Renaissance gem. Like other towns and fortresses in this mountainous area, dominated by rival warlords, it was built to repel invaders. As you toil up the steep, paved street leading from the city walls to the main piazza, and your calf muscles begin to ache you feel sympathy for the would be invaders. I was in Urbino to learn Italian at the University, which runs an annual summer course for foreign students. We stayed in the college buildings on a neighbouring hill, and walked to our classes in town every day. There were 150 of us, 21 nationalities in all, so learning Italian was one way of finding a common language. Over the weeks I progressed from being barely able to order a cappuccino, to learning the complexities of Italian poker at Luca’s bar. The Urbinati pass their days agreeably. A clique of elderly men gathers at the Café del Duca near the city gates every day to gossip and play cards. Others hang around the Piazza della Repubblica at the time of the passegiata, when people take an early evening stroll, meeting friends and relations to exchange the news of the day. There are indomitable old ladies, tapping with their sticks up the hill, young women teetering along on stiletto heeled sandals, and an occasional friar or nun. Urbino is a devout city – you can go to the Church of St Caterina on the Via Saffi to hear the nuns’ choir at evensong. During the main academic year, there are also a large number of students, and at night the piazza heaves with youth in search of a good time – there are 22,000 at the University, compared with a town population of around 15,000. The main sightseeing attraction is the ducal palace where you can spend two hours or more wandering around, from the kitchens and bathrooms underground to the state apartments. Enlarged and re-designed by architects under the instruction of Duke Federico, it still seems imbued with his spirit. Duke Federico da Montefeltro is best known outside the Marche for his strange nose, seen in a portrait by Piero della Francesca at the Uffizi. He is in profile, wearing a red hat. The lower part of the nose is prominent, but the upper part appears to be missing, the result of an accident while jousting. Federico liked to live comfortably and had his own sauna, designed on the system of Roman times. On the wall beside the furnace backing on to the sauna room, is a warning notice from the Master of the Furnace to his stokers, “Don’t forget your turn.” The drinking water collected by the cisterns was filtered through purifying carbon. Upstairs, the palace is divided into state rooms and a series of apartments for the Duke, his wife Battista Sforza, and guests. Some intriguing pictures are housed here, including Raphael’s portrait of a woman, known as “La Muta” as well as his early picture of St Catherine of Alexandra. The most unusual room is the Duke’s study, a small chamber lined with inlaid wood pictures that illustrate Federico’s interests. Through a half-opened trompe l’oeil cupboard door you glimpse books, candlesticks, an hourglass; through other doors, a guitar, a lute, and symbols of astronomy. The small, wooden-walled room provided the seclusion Federico needed for contemplation, away from the clamour of war or the buzz of court life. I enjoyed the tour of the palace in almost solitary state as one of the few who had realized that a hot afternoon in August was just the right time for marble halls designed to allow a breeze to blow through. It was now time to satisfy the inner person. I met friends at my favourite enoteca (wine bar) on the Via Raffaello, where the wine of the day is chalked up on the blackboard – a Vedicchio dei Castelli di Jesi, a light, crisp white wine of the area. For red, one of the best is the Lacrima di Morro d’Alba. With the wine came little dishes of salami on crostini, olives, and slivers of Parmiagiani, all part of the service, at around 2.50 euros a glass (£1.80). We had the difficult choice for dinner between the terrace of the Tre Pianti, which has a panoramic view of the countryside, or the upstairs restaurant at Il Coppiere, which specializes in dishes con tartufo nero. The truffles won, and I feasted on homemade ravioli festooned with black shavings, from which rose a seductive aroma. The Marche is truffle country, so there’s no better way of remembering your time in Urbino than buying a jar of truffles to take home. Just sprinkle onto your scrambled eggs and inhale.